This video came to me in an email from Tanya and it touched my heart deeply. Tanya Huang is the beautiful, energetic and talented designer/owner of Knot Theory which offers a new and very modern look at the tie and the bow tie. In this video she celebrates her birthday by sharing with the world a tremendously personal story as well the reason behind her edgy new look. As I was asked to share this wonderful personal testament with others, I decided this would be the best venue to reach the widest audience. I hope you will join me in honouring her birthday request to share this video far and wide. It's my birthday today! It's a HUUUGE day for me because I'm going to share a very personal story with you. The best birthday present you can give me is to share this video with your friends! I used to have a full head of healthy shiny hair. Then suddenly, when I was 10 years old, all of my hair fell out in days. Turned out I have Alopecia Areata, an autoimmune condition where my own immune system attacks my hair. It's a genetic disease that can affect anyone at any age. Men and women have equal chance of developing it. If other autoimmune conditions run in your family (e.g. type 1 diabetes, rheumatoid arthritis, psoriasis, or vitiligo the skin discolouration disease Michael Jackson had) you are more likely to develop alopecia reata. 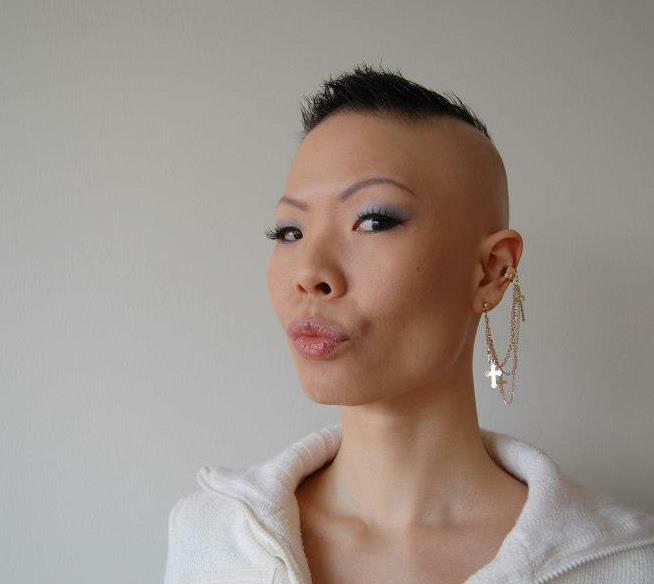 Having Alopecia made a huge impact on my life and my personality. Hair has always been valued as such an important thing, especially for women. Not having hair really devastated me, for a long time. Even when I thought I was over this hairloss thing because I had top of the line wigs that Tyra Banks and Beyonce wear, I was not quite ok. It is only recently, that I feel confident enough and love myself enough, to tell you about my alopecia and show you my alopecia! Alopecia World - a worldwide network for alopecians, with over 13,000 members. You can find my Vancouver support group here! NAAF - National Alopecia Areata Foundation, with several thousand members and yearly conference in the US. Children's Alopecia Project - for kids with alopecia! Copyright © 2013 Knot Theory Fashion House, All rights reserved. You are receiving this email because we think you are interested in reading about ongoing exciting happenings at Knot Theory!